Eeeeek! Between getting ready for Memorial day and throwing back Derby juleps, you forgot it was Mother's day. Stop! Breathe! You aren't alone, but before you give yourself a timeout for being a bad girl, check out our last minute recommendations that your mom will love - and best part, you can snap them up in real stores, so she'll never know you forgot! 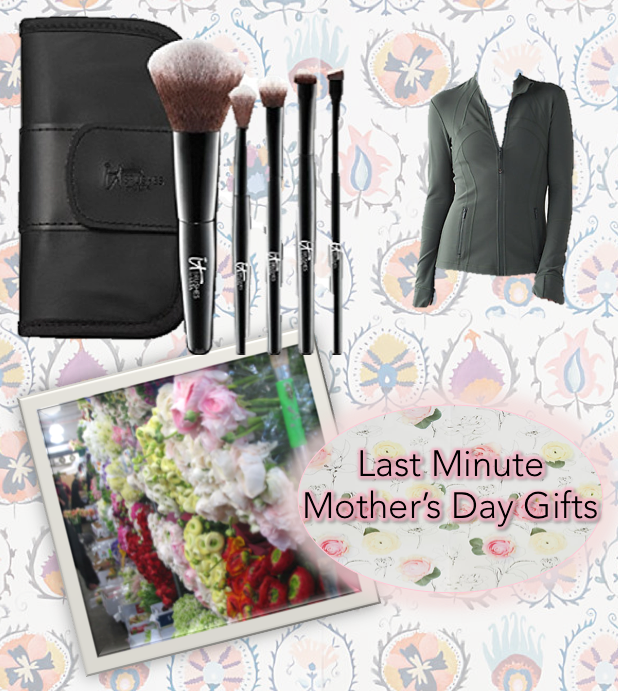 Your mom's a busy lady so get her something that reflects her on the go life-style. We can't get enough of the It Cosmetics Your Face & Eye Essentials Mini 5-Piece Face & Eye Travel Brush Set $30. It's loaded with brushes for every purpose, including great powder and eye shadow brushes and a liner brush can help get you ready in no time! 4 brushes to line, define, smoke out and blend. Plus the all-over complexion brush for all your basics from foundation to blush to illuminizer! Good thing about having a Lulu Lemon in every neighborhood is that you can pop in for a last minute gift you know she'll adore. We recommend the Define Jacket ($118) because it's super-flattering, easy to layer and comes in a variety of colors. As a bonus, Lulu's decorative and reusable bags mean you won't have to spend time and money on wrapping paper! If you're looking to get mom flowers, know that you are going to get taxed with a tardy fee. Leave your wallet in tact by visiting the flower district. Make your way over to 28th street pick up some peonies, layer on the lavender and let them wrap it all up in pretty paper. You can't go wrong with a beautiful bouquet that express how you feel about your main mama.